In the middle of November 2013, forum member Manofan noticed (from looking at pictures taken at the German Open) that Masato Shiono used Donic Defplay and Donic Bluefire instead of his usual equipment. I wanted to know more about this change and contacted Donic Germany to ask if Shiono indeed got a Donic contract and what equipment he was really using. Peter Becker very kindly responded that he was part of the Donic team even though it wasn't announced officially yet. He also gave the details about his equipment. In my reply to thank him, I asked (thinking 'you never know..') whether there would be a possibility to have a written interview with Shiono. He forwarded this request to Donic product developer Steffen Fetzner (Doubles world champion with Jorg Rosskopf in 1989) and Steffen brought me into contact with the Japanese Donic distributor Mitsunori Takizawa. He asked Shiono about the idea of doing an interview and Shiono agreed to do it at the appointment he was going to have with Takizawa only a week later! We quickly collected a lot of questions (viewtopic.php?f=56&t=24449) from many forum members. I had to make a selection by summarizing similar questions and leaving some questions out. I am sorry that not all questions were forwarded, that would have been too many. Mr. Takizawa translated our questions into Japanese and held a face to face interview with Shiono, which he recorded in order to later write it out and translate into English sometimes with the help of some online translators. After a few mails back and forth I understood all of the translations and I worked on a (hopefully) coherent text, sometimes with additions given by Mr. Takizawa. Here it is, I hope you like it! - Masato Shiono for giving quite detailed answers to our questions, for taking the time to give such a quality response. When reading the interview you can just feel what a nice, passionate and humorous person he is. - All OOAK members for posting questions (and posts) about Masato Shiono. Also for supporting this initiative. - And a VERY special thank you to Mitsunori Takizawa from Donic Japan for doing the interview, for all his translations and clarifications, for the smooth e-mail communication, for his enthousiasm and the great cooperation! I want to mention that quite some translation has been going on in this interview (from English into Japanese, from Japanese inti English and even that English had to be refined and clarified. Mr. Takizawa approved the final text. - At what age did you start to play table tennis and when did you decide to become a defensive player? Shiono: I started table tennis when I was 7 or 8 years old, but it was just for fun. I started with J-pen. When I was 10 years old, I adopted a more serious stance towards table tennis. At this time, I also changed into a chopper. - Why did you choose to be a defensive player? Shiono: I wanted to play distinctively from other players. And also my father was very attracted to the chopper’s game. Although he played J-pen himself, he was inspired a lot by the chopping game of Mr. Norio Takashima, who played in the same prefecture [former province of Japan] as my father when they were students. Mr.Takashima had a big influence in this prefecture. - Do you think it is better to start using pimples as young as possible if you want to be a defender, or not? Shiono: I think this depends of the player. In my case, I used inverted rubber on back side until I was 18 years old. My coach and I think this is better to learn the chopping game and to increase stability when cutting the ball. - Which players influenced and inspired you on your way to becoming a top defensive player? Shiono: Mr. Koji Matsushita and Mr. Hiroshi Shibutani for sure! - You have had so much success during the past six months, starting with the incredible victory at the Japan Open. How do you explain this “sudden” success? Shiono: The one thing I can think of is that I am together with a special girl since this year. So I have no doubt that my feelings and motivation were changed. Also, just like in other countries, it is very difficult in Japan to become a selected player for the World Pro Tour. That's why I could play only a few times at an international tournament. So I concentrated very hard on these tournaments. Fortunately this lead to a big success in Japan! - How did winning the Japan Open change you? What did it mean to you and what were the reactions of the people around you? Shiono: Surely my feeling of responsibility was changed. I can't afford to just play badly or not concentrate anymore, but I need to determine my strategy not only against Japanese players but to players from all over the world. There were so many people that were so very enthusiastic about my winnings. That was delightful, but at the same time I have to control my motivation and not be influenced too much by the joy and emotions of my direct environment. I have to concentrate and prepare for the next big tournament. - We interviewed Mr. Joo SaeHyuk last year. He said that the best match of his life was the match against Ma Lin in Paris 2003. What do you consider as your best or most memorable match up till now? Shiono: Only one? I can think of three matches, not only one , sorry, haha. First of all, against Chuang Chih-Yuan in Japan open 2013, which I think this was one of my best matches and everything I did went well. That was real nice match! The next is against Ma Long in WJTTC 2004. I lost that match 1-4, but it was first time I could experience playing at an international level and feel the difference compared to my own level. 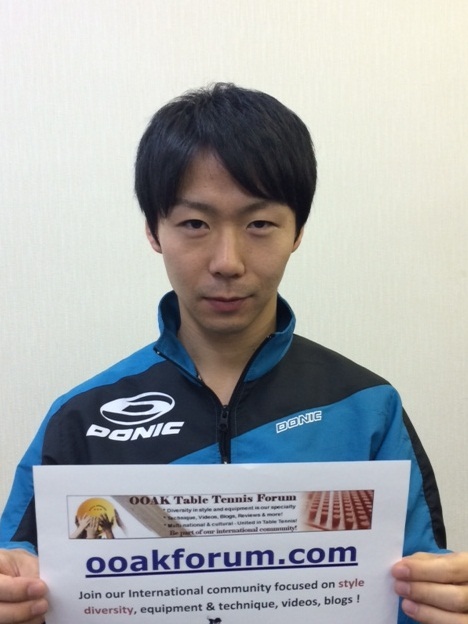 The third one is my match against Hirano [Yuki] at the All Japan Championship 2013. Unfortunately I lost 3-4, in the best of 32, it was my first match. It was a quite close game but I didn’t manage to win the last set. I seriously considered quitting table tennis after that match. Yet, I finally chose to continue and to be more focus at table tennis. That's what I did the last six months. I owe this very much to Hirano and to what I learned from that match. - What style of player do you find it most difficult to play against and why? Shiono: Hmm, let's say a more persistent player than me. It doesn't really make a difference if it is a defensive or an attacking player. - If you have to play Primorac again, what's your game plan? What make it so difficult to play against him? Same question for Shibaev and Ovtcharov. Shiono: Good question, haha. First of all, I felt there was a real big difference in "experience" between them and me, and then I mean not only Primorac. They caught the flow in the match and captured the heart of the audience. They got the important points, and they won the longer rallies, where I couldn’t finish the point. Ovtcharov had home court advantage at the German Open while Shibaev had home court advantage at the Russian open, so they both had full support from the crowd. My plan is to be more patient and more focused and persistent in my cutting and chopping game in the future. - What’s your strategy against other defensive players? Shiono: Basically the same answer as the previous one. I would try to be patient during a point, as there is really no need to go out of your way to start attacking defensive players. - What sponge thickness do you use with your long pimples? Shiono: I use the thinnest, 0.5mm sponge. - Why do most modern defenders use a thick sponge under their long pimples? Why do you play with a thinner sponge? How can you vary the spin so well with it? Shiono: Really! I did not know that modern defenders using thick sponge, sorry, haha. I want to ask them who can dampen down the ball with a thick sponge. Close to the table, pushing makes more spin with a thick sponge but I feel that the thinnest sponge can make maximum spin when chopping far from the table. Also, control is most important for me. I think stability is the most important thing for a defensive player. That's why I like a thin sponge. Also I like this dampening effect provided by the thinnest sponge. - Could you tell us about your routine of training (i.e. exercises, multi-ball, fitness, footwork)? How many hours per day, and days per week, do you spend training? Shiono: In the morning I train 2 hours, in the afternoon 2.5 hours and fitness 0.5-1 hour. About content: the ratio between chopping and attacking is about 7 to 3, as well for exercises as for multi-ball. I spend about 30 min for fitness, focusing on lower body. And I also like running as a daily routine. - Your footwork is amazing. You are incredibly fast. Is there some particular training that you do for your footwork? Shiono: Thank you so much! I think it is caused by good shoes, haha! I am doing footwork practice with multi ball, mainly. I am not so tall, so footwork becomes a very important factor. My coach told me exactly how I should move when I joined the Tokyo Arts team. It is clearly far better now than it was before. - What equipment are you currently using or intending to test? First of all, I would to thank Donic. Donic has good equipment and I am very satisfied using the Defplay blade and Bluefire JP01 rubber. I'm using it in Max thickness but I'm going to try 2.0 for getting some more control. I'm also testing some LP rubbers. I am currently testing Akkadi L2 and Aligator Def. - What do you think about the Defplay blade? Shiono: I have first played with Defplay Classic but now I use the Defplay blade. This blade has good feeling with a lot of control, and also has a good attack. For my game, I prefer/need spin above speed and Defplay can really grasp the ball long time [high dwell time] but still there is enough speed for me when I attack. I can still bring back the ball to the table from far away from the table. - What do you think of DonicBluefire JP01? Shiono: I tested almost all Donic rubbers and I was especially satisfied with JP01. This rubber makes easy spin, good attack and additionally good control. Spin, speed and control are very balanced. - Why does Japan have more great classical defensive players (N. Takashima, K. Matsushita, M. Shiono, …) than any other country? Hm, national character can be one reason. patience, for example. Please note that I don't want to say that people from other countries don't have this character, haha! - Being the first great Japanese classical defensive player, what role did Norio Takashima play for defensive players? Shiono: A very big role. I met him only once or twice. Especially his mentality is so great. I respect him a lot. - Same question for Koji Matsushita. We saw a training video with you and him. How did he influence you and other players? Shiono: I learned the chopper's affinity from him. He is like a class book, and he inspired me to become a good chopper. You know he had GREAT stability. Donic Japan: Koji Matsushita inspired Shiono, but it was only occasionally that Koji Matsushita advised and coached Shiono in the National team. He has never been an official coach for him. - What can you tell us about the new generation of defensive players in Japan? One example is the young Yuto Muramatsu with an uncommon game (short pimples, often twiddling to attack with the backhand), there is also Miuchi Kentaro. Shiono: It is good for Japan and for choppers. I know them well, especially Miuchi, as he played in the same University team as I did. However each has his own style. Muramatsu has a good ‘back attack’ [counter attack or backhand attack?] and good variation with short pips. Miuchi has good forehand smash. And I play the game by chopping. - It is very silent around Yuto Muramatsu. How is he? - What are your personal, long term table tennis goals? Almost all players quit TT when they feel they limitations. It is the same for me. Now I do not want to think about my "goal". As I said, my bifurcation was this year's All Japan championship, and I chose to play TT more and more. So now TT is everything in my life. - Is there any particular aspect of your game that you would like to improve? - Are you planning to play in a European club in order to gain new experiences? Shiono: Of course I have interest. However, I am sorry, in the current situation I can't play in top league for Japan and also in another country. As now I'm playing Japanese top league, I can't play in DTTL [German table tennis League] first division for example. Now I play for my company club, Tokyo Art team. I am really grateful to this team. - What's your opinion about the new plastic balls? Had you the chance to try some prototype? Shiono: I tried one of those test balls a while ago. In my opinion choppers will need more force. However I may have to change that opinion because I heard the latest prototype would be more close to the current ball. - What’s the future of defensive table tennis in general? Is the situation different for men and women? Why? Shiono: I understand new defensive styles are appearing now, half-and-half styles with a lot of forehand-attacking combined with backhand chop. It is all right, table tennis will change constantly. But this is not what I call 'the chopper', haha! I consider myself as a chopper. Chopper is Chopper: From early time until today, choppers should get a point by mainly cut and chop, I think. So many people today are saying: 'choppers need to have more attacking skills, just like attacking players. In my opinion, choppers should train chopping skills much more than attacking skills during training and practicing. Therefore I hope to build the new style AFTER I get the fundamentals in place. Please do not lose sight of the basic chopping strokes and of the reasons you chose to be a defensive player/chopper. I do not like people saying "Shiono should attack more", haha! I am very aware my attacking skills aren't as good as those of Joo [Saehyuk], Chen [Weixing], etc. They have very good attacking skills on top of the well-grounded defensive skills. You know, their basic powerful chopping skill is of a very high level. On top of that, with this basis, they built their attacking skills for finishing the point. So their level can really be called "Top level". It is only after I get that [basic chopping] level, I will go ahead to improve my next skills. Sorry for digressing a bit from the question, haha! Women are better in their cutting-chopping skills compared to men, so I think woman need big difference in spin variation, between spin and no-spin with the same rubber. For men, it is much more important to get the right feeling to damp down strong balls, like speedy loops and smashes. Please note it is only my opinion! Haha! - Did you know that you have many fans from all over the world, especially here in the OOAK Table Tennis Forum where we have a special topic dedicated to you that is followed by thousands of people? Shiono: I am sorry, I did not know that such great fans watched me and cheered for me. Amazing! - What do you do in your spare time when you aren't playing table tennis? Shiono: Currently everything in my life related to TT. I just can’t stop thinking about TT. - Who's your favorite sportsperson of all time? Shiono: Ichiro! [The best of Japanese Baseball player, New York Yankees] He is proud of Japan. - What’s your favorite food, favourite drink and your favourite car? Shiono: Restaurant Tajima's hamburger haha. This restaurant is located next door from my house. I love them. J.O.Waldner and J.Persson visited this restaurant when they came to Japan in the past. Drink? "Azumino-Yusui" [Water, his company sell this water], I have no doubt, haha! And Japanese Sapporo beer, "EBISU" is also my favorite drink. I like TOYOTA Crown. This image, design, concept, and logo... perfect. - Would you like to add one last tip or an inspirational message for other table tennis players looking to succeed? Shiono: Enjoy watching the chopper's game. I will do the best I can to show you my style of chopping. I would like to thank all of all of my fans and I promise to carry on a good level for high entertainment! Last edited by Pipsy on 25 Jan 2014, 04:09, edited 2 times in total. What a great interview, and I especially enjoyed all the laughing. I have no doubt that he laughed in those exact places during the interview . Most importantly, who is this special girl in his life that motivated him to be more successful in TT and step up his game? If we would have known about that ahead of time, we could have asked for all the juicy details . Anyways, thanks to all involved in the interview, and I'll always be looking forward to watching a Shiono match! He knows what's a good blade, I like him . Thanks to those involved for all the fantastic work and effort putting together such a fascinating interview. Shiono somehow answered my question indirectly in his responses to others'. Fantastic! So inspiring to read about him (I really liked the detail about the girl, I would never have guessed that)! And a great set of questions! Thank you all so much for taking the effort of doing this. Haggisv, is there some sort of medal of honour? Like "beyond the call of duty"? I think Pipsy well and truly deserves one for all the time and effort he spent on this! Terrific interview. Interesting that he considers himself to be more of classic chopper. I don't know if anyone else picked up on this, but I found this fascinating! It sounds like he feel he can control fast balls better with a thin sponge, whereas I've always thought the opposite. I picked it up. It might be the case with certain sponges, e.g. The sponge underneath a DTecs. Still you would assume the sponge of the P4 is more dampening the thicker it gets. "So many people today are saying: 'choppers need to have more attacking skills, just like attacking players. In my opinion, choppers should train chopping skills much more than attacking skills during training and practicing. Therefore I hope to build the new style AFTER I get the fundamentals in place. Please do not lose sight of the basic chopping strokes and of the reasons you chose to be a defensive player/chopper." Not referring to walls like Joo or Chen, but there are modern defenders (amateur and pros) who can learn a lot from this statement. Who's the coach? Not Koji? I'd love to know more about this part "My coach told me exactly how I should move". It'd greatly help my understanding of chopper game. Can we ask him again? Thanks so much for all of your effort in putting together this wonderful interview. Shiono seemed to mysteriously come out of nowhere so quickly, to play so well, and win major tournaments. After reading this interview, I feel that to some extent I know him, which is really great.